Since childhood Edward Broadway has had an abiding interest in design and making things. During visits to Scandinavia in the 1950s and subsequent years he was impressed by the overall quality of design and manufacture, an impression shared by such well-known designers as David Mellor, Terence Conran, Robert Welch and Gerald Benney. Edward’s designs for jewellery and tableware are based on the same design philosophy, simple functional pieces with the minimum of decoration. Edward has not always been a silversmith. After training in London he was appointed in 1957 as the first consultant orthodontist to the then East Anglian Regional Hospital Board. He developed an interest in postgraduate medical education, chairing the region’s Medical Education Committee and became the first Regional Director of Postgraduate Dental Education. For ten years he served as the vice chairman of the Regional Health Authority. It was his son’s advice that he would need to take up another interest well before he retired from this busy schedule that prompted him to attend evening classes in making precious metal jewellery. Later, during long weekend courses at Writtle he attended master classes led by George Grant, a free lance silversmith with very high standards and an excellent teacher to whom he owes a great deal for his technical training. Largely, though, Edward has taught himself, working in what was once his children’s playroom with tools he has acquired over the years. He says that the link between his hospital work and his present occupation is quite tenuous, mainly a need for a high degree of manual dexterity, precision and patience for both. Edward Broadway is one of a number of designer jewellery members of Suffolk Craft Society working in precious metals. Their work can be seen all the year round at Gallery 2, the Town Hall, Ipswich from Tuesday to Saturday 10.00am - 5.00pm. The Society also has a well recognised summer exhibition which is open for six weeks in July and August. 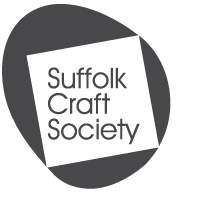 Edward, who has been a member of Suffolk Craft Society for over twenty years, says that it offers him sales outlets in desirable locations and generates commissions. It also gives him much valued camaraderie and exchange of ideas with many highly skilled craftspeople in different disciplines. The basic tools necessary to make metal jewellery are simple – fine saws, files, hammers, a vice, various pliers and forming stakes. For soldering a propane gas cylinder with torch and fire bricks are needed. The basic techniques for silversmithing and the making of jewellery have not changed since ancient times. The Anglo-Saxon jewellery at Sutton Hoo demonstrates what can be done with the most basic equipment. Propane gas and electricity make life easier today. The very old lost wax technique is still used for casting, a similar though more sophisticated process to that used by old bell makers. Casting, the pouring of molten metal into a mould, is used in jewellery when it is necessary to make a large number of identical pieces. Edward says that there is much debate about the future of crafts. Europe and the USA face intense competition from eastern countries where labour costs are low and modern computer-aided design and manufacture, subsidised by governments, can produce well- designed, high- quality goods. The producer can alter a design quickly and easily, making it economically possible to have very short runs, so overcoming the stigma of mass production. An exciting future is ahead at the new Goldsmith’s Institute in Clerkenwell, where the Goldsmiths’ Company is embarking on an educational project to train apprentices and postgraduates in modern techniques of design and manufacture. The jewellery by craftsmen like Edward Broadway is meticulously hand-made and original. It is modestly priced and worth every penny! The consequence of his son’s timely advice to his father is, for Edward Broadway, a continuing enjoyment of his craft. He trusts that his customers share his satisfaction.